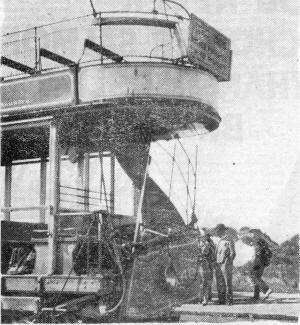 Newspaper report about a tram collision in 1931. William E. Gregson (45), cotton salesman, Garthside, Merton Road, -Ashton-on-Mersey ; injuries to face, and shock. Mrs. Ada Gregson, his wife, bruises on face, and shock. William Keith Gregson (7), son ; cuts on forehead and shock. Joan Marjory Gregson (10), daughter ; bruises on head and shock. Jaspar Broomhead, tram driver, 143, St. Andrew's Road South, St. Annes; injuries to the left leg. The two cars, carrying a number of holiday-makers, were going along the Drive towards Blackpool, and the first car, which was driven by Robert Grenville, 7, Westgate Road, Squire's Gate, stopped just before it reached the Thursby Home, to pick up passengers. As it was moving off slowly, the second car, driven by Broomhead, crashed into it from behind, partially telescoping it. The back of the first car and the front of the second car were wrecked. Fortunately there were not many passengers on either car. Mr. and Mrs. Gregson and their son and daughters were passengers in the rear portion of the upper deck of the first car, and when the crash came they were thrown. They were taken to the Victoria Hospital, Blackpool, but after receiving treatment they were able to return to St. Annes, where they were staying. Broomhead, who was thrown into the road, was conveyed by a passing motorist to St. Annes War Memorial Hospital and was detained. A breakdown gang was summoned, one of the cars was towed to the depot, and the service was subjected to a short interruption.